Lots of teachers want to integrate tech into their class but picking what to use among the thousands of offerings is daunting. 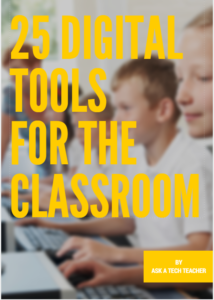 The 56-page 25 Digital Tools in the Classroom is a thorough discussion on which are the most useful tools in any K-8 classroom, classified by appropriate grade level. This includes popular digital tools such as blogs, backchannel devices, vocabulary decoding tools, avatars, digital portfolios, digital note-taking, and more. This is the same as the Ask a Tech Teacher resource, 25 Digital Tools in the Classroom You don’t need to purchase both. 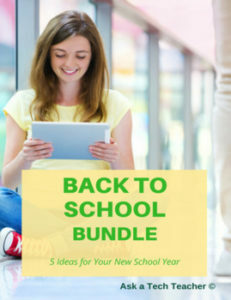 Topics cover keyboarding, digital citizenship, search/research/ mouse skills, problem-solving, critical thinking, digital devices, shortkeys, reading, classroom of tomorrow, technology skills, and more. 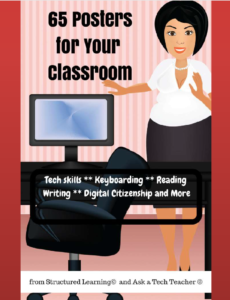 This is the same as the Ask a Tech Teacher resource, 65 Posters for Your Classroom. You don’t need to purchase both. Digital note-taking has benefits paper-and-pencil note-taking doesn’t—like sharing, collaborating, saving everywhere. Have students become familiar with approaches from traditional word processing tools to web-based tools like, Google Docs, Flipboard, Evernote/OneNote, and Twitter. This is the same as the Ask a Tech Teacher resource, Digital Notetaking in your Classroom. You don’t need to purchase both. Introduce the brevity of Twitter’s 140-character limit in writing. Use it in a variety of tasks where that sort of pithiness is best-suited–backchannel device, collaboration, journaling, note-taking, quick assessments. Designed for Middle School, it’s aligned with Common Core and ISTE Standards and includes a rubric for assessment, as well as over a dozen other methods to assess learning. This is the same as the Ask a Tech Teacher resource, Twitter in the Classroom. You don’t need to purchase both. Not all kids are born writers. Some are artists, musicians, comedians, or another variety of visual learners. In this 20-page collection, we show you 14 ways to meet these students where they are most comfortable as they learn how to communicate ideas with words. You get lesson ideas (not complete lesson plans, but enough to get your creativity going), samples (where possible), and assessment strategies. 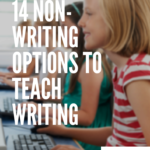 This is the same as the Ask a Tech Teacher resource, 14 Non-writing Options to Teach Writing. You don’t need to purchase both.